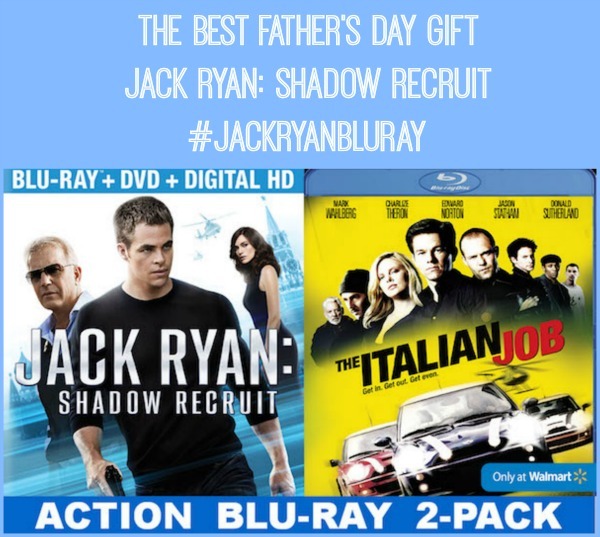 If you’re looking for the best Father’s Day gift for the dad(s) in your life, look no further… Tuesday, 6/10 through Saturday, 6/14 ONLY, Walmart has the exclusive release of Jack Ryan: Shadow Recruit (starring Chris Pine, Kevin Costner, Keira Knightley, and Kenneth Branagh) for $12.96 AND you get $15 off sports tickets at Ticketmaster. If that wasn’t awesome enough, Walmart’s exclusive pack also includes The Italian Job. Two action-packed movies and $15 off sports tickets… all for one very low price? Wow! I know, right? My husband is a huge ‘Jack Ryan’ fan; from Hunt for Red October to this newest one, Jack Ryan: Shadow Recruit, he loves them. We both are Chris Pine fans (maybe for different reasons) and find he makes a great Jack Ryan. My Dad is a huge fan, too. We fell in love with the character Jack Ryan when we first read the Tom Clancy books. This makes shopping for Father’s Day a breeze for me. I’ll be heading to Walmart on June 10th to pick up two Jack Ryan: Shadow Recruit Action Blue-Ray 2-Packs. Head on over to Walmart or online starting next Tuesday, June 10th – June 14th to get this exclusive offer for the special man in your life this Father’s Day! I loved the movie The Italian Job. My husband would like to see the other one. Colleen, I’ve never seen The Italian Job, so I’m looking forward to see it now even more. That looks like a great father’s day gift idea for sure. My husband would totally LOVE this! He’s an action movie aficionado. My hubby would ,love these movies! Sounds like a really neat offer. I love watching movies, might have to get this! I haven’t seen either of these. I guess I’ll add them to our list! These are some super cool movies, great gift! I really liked this movie. I’m sure my Dad would too. I didn’t catch this movie in theaters and would like to see it because I’ve read the Jack Ryan books.